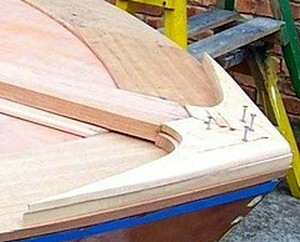 Malahini Construction the contining story of a Plywood Boat being built in Tasmania from a Glen L ply on frame design. Starting to lay the Decking. 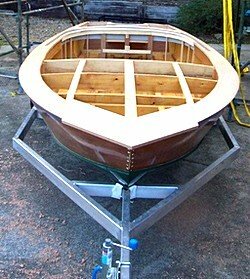 Now that she is the right way up I can begin fitting the deck framework. 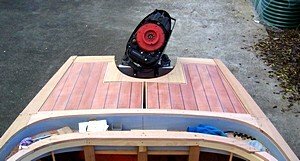 This picture shows the motor well which still needs a bit of a trim on top before the deck goes on, curved of course because square would be too easy. I have attached the aluminium motor plate as well and some drain plugs. 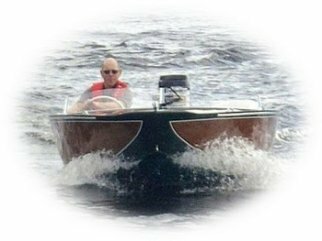 The grey plastic shape past the motor well is for the Bimini to fold down into, which will have a cover over it, curves once again. You can also see the floor and some frame work for the rear bench seats. 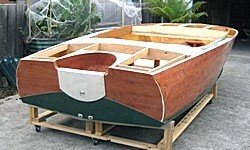 I have used some ply as a template for the dash so I can fit all the instruments and steering wheel. 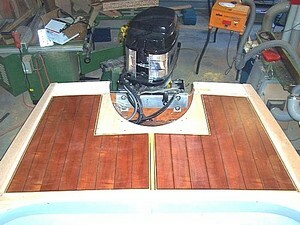 I will then use this template to cut out the real dash which will be Huon Pine. 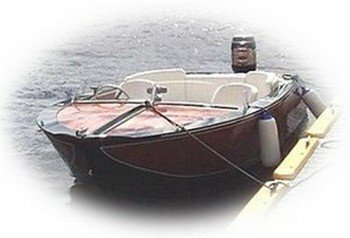 I have now faired the motor well and Bimini cradle. 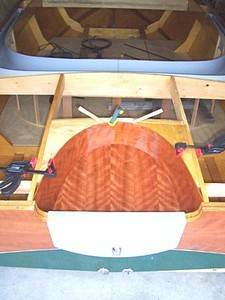 This Photo shows the Bimini Hood Up. 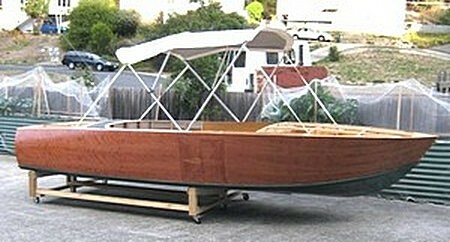 And this next photo shows how neatly the Bimini folds away into the cradle. 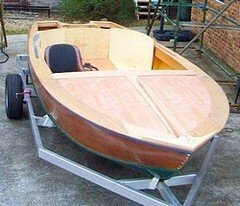 I have now started decking my plywood boat. 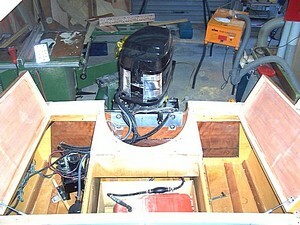 The open section at the rear will have a hatch for storage. 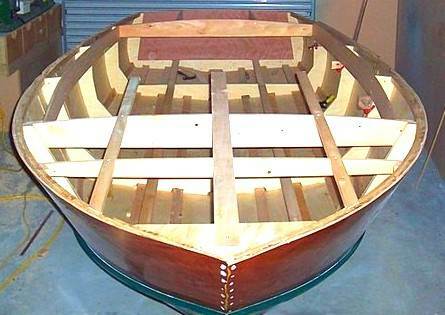 Its getting pretty cold here again so the glues I am using are being difficult hence I have been dry fitting the deck rails etc so that they can be glued later when it starts to warm up again. I have made a couple of covers for the back hatch's and a trailer. 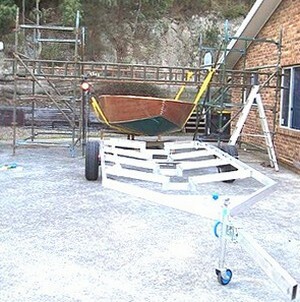 ( still some work to do on the trailer to finish off). 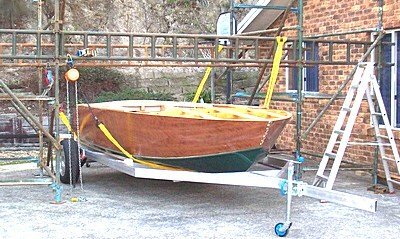 After the fiasco of the shed door not being wide enough to fit the trailer in so I could hoist my plywood boat onto it, plan (B) came into effect. In other words build a gantry outside using scaffolding. Need to make sure wheels are in the right place and position post for winch and then back to johns to finish welding and put all the lights etc on. Engine getting worked on at the moment as well. I have almost finished the curved rear seating. Just need to trim the top and then it can be upholstered. 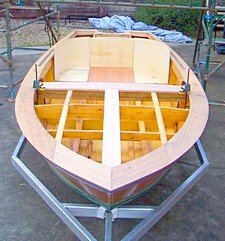 I have finished all the deck rails, just waiting for a bit of warmer weather so I can glue them on. Have dry fitted a few more things. The deck is actually Myrtle and a lot more colourful than the photo. The detail at the front need some more planing to round off. Still waiting on some warm weather to start gluing. 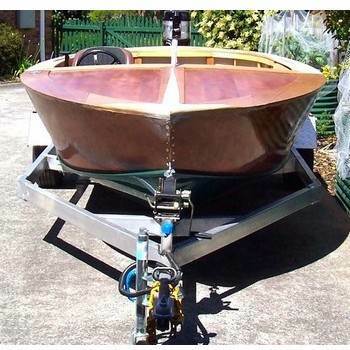 As the Hobartians would know we have had a lot of rain (only on the weekends though with sunny weather during the week) and the boat has been outside while I finished the trailer. 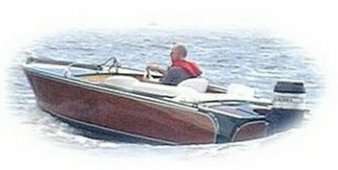 Had to be outside because the boat had to come on and off the trailer using winches and the scaffolding, which is now gone) while I fitted it to the boat, got it checked and registered. I can work on it even if its raining ( as it was again today). Engine has been fully rebuilt and repainted. 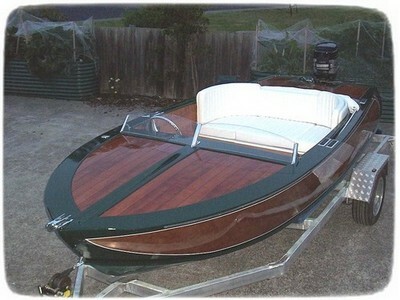 She will be in the Wooden Boat Festival in Hobart February 11th to 14th 2011 so come and have a look. 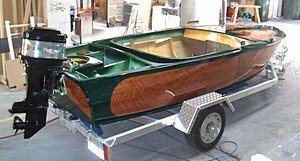 I have had some time to work on the boat ‘cause I'm on Holidays. And can actually begin to see the light at the end of the tunnel. 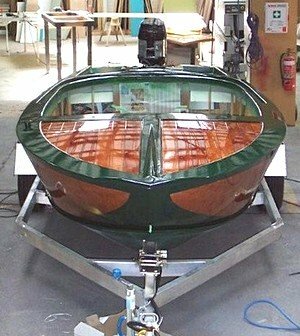 Pete sprayed a couple of coats of sealer on the boat to prep it for the final spray. Some more fine sanding this weekend and then finishing topcoats next week. 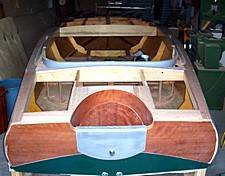 1 week to go to the Wooden Boat Festival and the boat is getting there. Pete has undercoated, painted and glossed the exterior (a brilliant job thanks Pete) and it’s now ready to bring back home and fit-out. Seats should be ready in the next couple of days and sign-writing will be done during the week (thanks DJ). A bit of work still to do but should be all done by Friday. 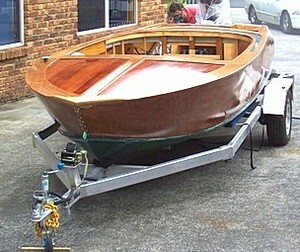 A few things still to do which may have to be done at the Wooden Boat festival but all the main stuff pretty much done. Finally took "Faro da Magia" out for her maiden run. A pretty windy, choppy day so didn't get to open up the throttle to much. Did get up on the plane pretty quickly and she went where I steered her and didn't leak any water. So all in all pretty happy (understatement of the year). Back to Andrew’s Malahini Part 1.